Rose-Adélaïde Ducreux’s 1791 self-portrait depicts her as a fashionable and accomplished 18th-century woman wearing a lustrous silk cream and sea green striped robe à l’anglaise. Rose-Adélaïde Ducreux (1761-1802) numbered among the well-known female court painters of late-eighteenth century France. The eldest daughter of court painter Joseph Ducreux, Rose-Adélaïde was sent to Vienna to paint Marie Antoinette prior to Marie Antoinette’s marriage to King Louis XVI of France (Klingsöhr-Leroy). Born into a wealthy artist family, Ducreux learned how to paint in her father’s studio and participated in her first group exhibition in 1786. She made her debut as a painter at age thirty at the Salon, where she displayed two paintings including Self-Portrait with a Harp, a life-size, standing self-portrait (National Museum of Women in the Arts). Ducreux’s self-portrait portrays not only fashionable dress of the late-eighteenth century, but also the central concept and practice of artful living in the period. Musical appreciation and proficiency, for example, were essential components in the formation of elite social personae. This was especially true for women as musical aptitude was seen as a sign of refined femininity and greatly increased a young woman’s marriage prospects (Koda 45). It was for this reason that many fashionably dressed women appear in portraits alongside harps or other musical instruments. The garment seen in Ducreux’s self-portrait is a robe à l’anglaise, an open robe consisting of a bodice cut in one piece with an overskirt separated at the center front to expose a matching petticoat (Metropolitan Museum 2015). The robe à l’anglaise appears to be made of silk taffeta woven with vertical stripes. The fashionably close-fitting bodice was designed to be worn over a corset. Delicate white lace trimmings finish the turned-back cuffs on Ducreux’s elbow-length sleeves. A contrasting petticoat in white or off-white silk taffeta is worn underneath. The artist wears a delicate silk fichu with lace ribbons crossed across her breast and tied behind her back at the waist. This style of robe à l’anglaise with curved baleen hip panniers supporting a decorative petticoat exposed by an overskirt with an open center front became fashionable in the late eighteenth century (Delpierre 21). 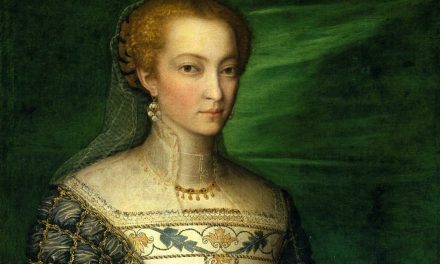 As the name implies, the dress style originated in England but was quickly adopted in France as a fashionable and simpler alternative to elaborate court dress. One of the artist’s other known portraits, Portrait d’une femme tenant sa fille sur ses genoux (Fig. 1), shows a woman dressed in a remarkably similar fashion to Ducreux in a striped robe à l’anglaise with an open center front pulled back to reveal an off-white petticoat. A fichu, a sort of scarf worn over the shoulders and tucked into the bodice or tied at the back, was a common accessory seen among laboring women in the countryside (Fig. 2) and was adopted by leading fashionable figures like Marie Antoinette who sought to return to a simpler pastoral life. Antoinette famously built the Hameau de la reine, a small village farm on the grounds at Versailles. Ducreux’s fichu preserves the form of the fichu, but in a transparent, light silk (rather than cotton) that was fashionable across Europe (Delpierre 21). The fichu element is also seen in Portrait d’une femme tenant sa fille sur ses genoux. As found in fashion plates such as La Galerie des Modes and Gallery of Fashion, which were popularly distributed in France, Ducreux’s dress reflects the trends at that time. An 1784 illustration (Fig. 3) depicts a robe à l’anglaise that has a similar silhouette as Ducreux’s dress, but with more elaborate trimmings. Striped textiles began to reappear in the 1760s and were fashionable since the mid-1770s (Delpierre 54). At the end of the century, the taste for more limited decoration on dress was pronounced as seen in Ducreux’s dress (Delpierre 21). Another example of robe à l’anglaise made of silk twill and silk plain-weave stripes can be found at the Los Angeles County Museum of Art collection (Fig. 4). 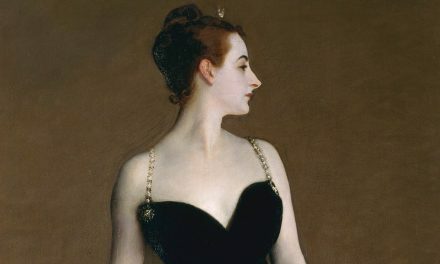 The details such as silk fichu, a large curtain of scarf, and half-length sleeves decorated with silk cuffs are similar to the dress in the artist’s self-portrait. A pink silk satin robe à l’anglaise also can be found at the Ulster Museum, National Museums of Northern Ireland (Fig. 5), highlighting the glossy fabric which Ducreux delicately articulated in her self-portrait. From the Regency to the French Revolution, there was little variation in shoe shapes. The toe was never square in shape but only round or pointed. Two different styles of shoes were favored by high-class women. One is the mule for indoors and another is high-heeled shoes for more formal occasions. Mules were commonly decorated with embroideries, velvet or leather (Bossan 51). Those mules and high-heels were popularly depicted by the period’s artists including Ducreux’s paintings which reveal the pointed toe part of the shoe. Elaborately curled and powdered hairstyles continued to prevail in the late-eighteenth century, but became less exaggerated than in earlier decades (Laver 148). Late-eighteenth century style fashions have influenced many contemporary designers, as the Met’s 1998 exhibition, “The Ceaseless Century” explored (Martin). Among them, French fashion designer Christian Lacroix, whose background is in historical costume, adopted the flourish of the 18th century for his 2013 Couture Collection. His striped dress with a bust-and-bustle silhouette and tight-fitting bodice was featured in Vogue’s September 2013 issue (Fig. 6). The model posed similarly to Ducreux in her self-portrait to emphasize the dress’s fullness. Although the large ribbons and neckline of the garment are not closely related to the late-eighteenth century fashion, the overall aesthetic has the touch of the period. Bossan, Marie-Josephe. “18th Century.” In The Art of the Shoe, 51. 1st ed. New York: Parkstone Press, 2004. Delpierre, Madeleine. “Clothing and Fashion.” Dress in France in the Eighteenth Century, 20-21 & 54-55. New Haven: Yale University Press, 1997. Hill, Daniel Delis. “Chapter 18: The Eighteenth Century.” In History of World Costume and Fashion, 423-426. 1st ed. Upper Saddle River, NJ: Pearson Prentice Hall, 2011. Klingsöhr-Leroy, Cathrin. “Ducreux, Joseph.” Grove Art Online. Oxford Art Online. Oxford University Press, accessed November 26, 2015. (subscription required). Koda, Harold. “The Portrait: An Unexpected Entanglement of Tesse Room (Paris, CA. 1768 – 72).” In Dangerous Liaisons : Fashion and Furniture in the Eighteenth Century. New Haven: Yale University Press, 2006. Laver, James. “The Eighteenth Century.” The Concise History of Costume and Fashion, 141-148. 1999. Martin, Richard. The Ceaseless Century: 300 Years of Eighteenth-Century Costume. New York: The Metropolitan Museum of Art, 1998. Metropolitan Museum of Art. “Robe à l’anglaise.” Accessed December 9, 2015. National Museum of Women in the Arts. 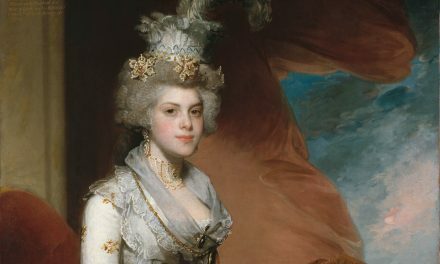 “Royalists to Romantics: Spotlight on Rose Adélaïde Ducreux.” May 15, 2012. Accessed November 28, 2015. Shinhwa Koo, an Art History and Museum Professions BS student at FIT (class of 2016), researched and wrote this while taking HA 344: The History of Western Costume (Fall 2015), taught by Prof. Justine De Young. She has developed her expertise in art history and museum studies through various internship experiences at arts and cultural institutions including the Solomon. R. Guggenheim Museum, Asia Society, Korea Society and the Museum at FIT.